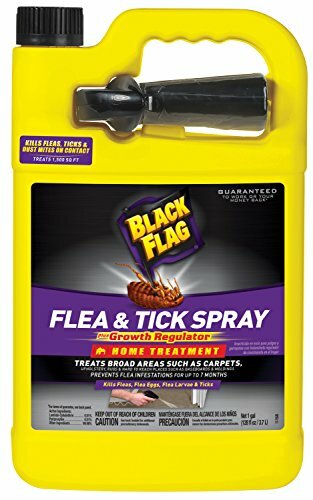 Black Flag Extreme Flea & Tick spray effectively and easily treats broad areas such as upholstery, rugs and hard-to-reach places such as baseboards and moldings. Nylar, one of the active ingredients, helps to break the flea cycle by killing adult fleas, flea eggs and flea larvae and works to prevent flea infestations for up to 7 months. Best practice is to inspect the area for fleas 2 weeks after initial treatment and reapply if necessary. If ticks are present, spray directly onto ticks to kill them. Also kills carpet beetles and dust mites on contact. When used as directed, will not stain furnishings or carpeting. Treats up to 1,500 sq. Ft.
Comes in 1 gallon jug, covering up to 1,600 sq. ft.